Most successful traders can determine when to enter or exit the market because they’re able to look at the price chart of an instrument and determine if the markets are moving in a pattern (this is called trending) or simply moving back and forth around a point or between two levels (this is called ranging). 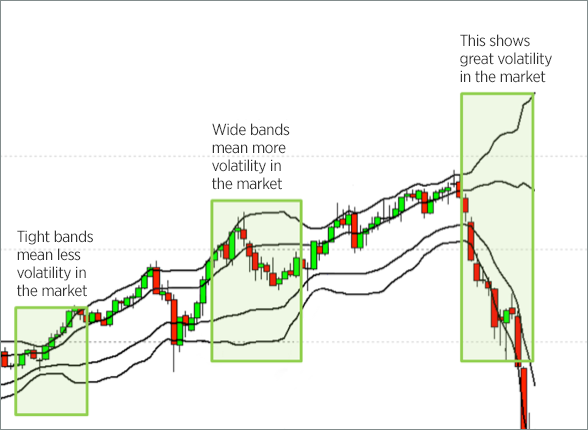 Bollinger Bands are great tools to use to help determine when a particular instrument enters or exits a trend. In this example, two sets of Bollinger Bands were plotted on a chart. The first bands were set to 20,2 (which means two standard deviations away from the 20-day moving average) while the second were set to 20,1 (one standard deviation away from the 20-day moving average). In the chart above, the upper Bollinger Bands of the two sets create a buy zone. Typically, when an instrument is in a strong uptrend, it will remain in this zone for some time. 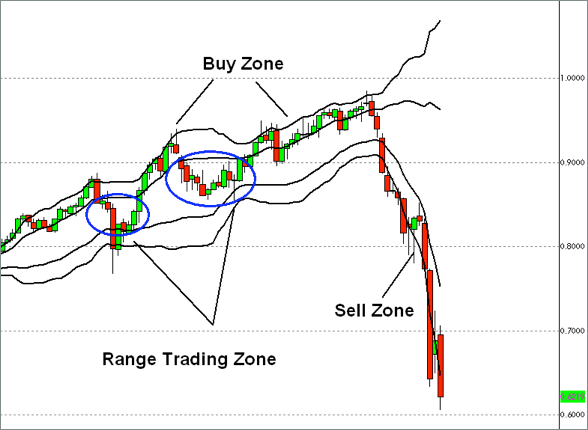 The two lower Bollinger Bands create a sell zone. When an instrument is in a strong downtrend, it will also stay in this zone for a while. If the instrument closes below the buy zone or above the sell zone, it’s entered the range trading zone.